Fiddler crabs are beetle-sized crustaceans that scurry sideways along some of the beaches and intertidal mudflats of New York City. I've seen them in parks in Queens, Brooklyn and the Bronx. They climb in and out of small holes after the tide goes out, the males dragging their extra-large claws along with them (the females have equal-sized claws). These small crabs eat by using their claws to shovel food in their mouths, capturing algae, microbes, fungus and other decaying detritus and returning what's left in small balls on the ground. Their dining habits are thought to help preserve the wetlands by aerating the substrate. The Fiddler Crabs video was shot on July 25, 2015, and August 22, 31, September 20 and 23, 2017, at Marine Park in Brooklyn, Pelham Bay Park on Hunter Island near Orchard Beach in the Bronx, and Broad Channel Park on Jamaica Bay in Queens. 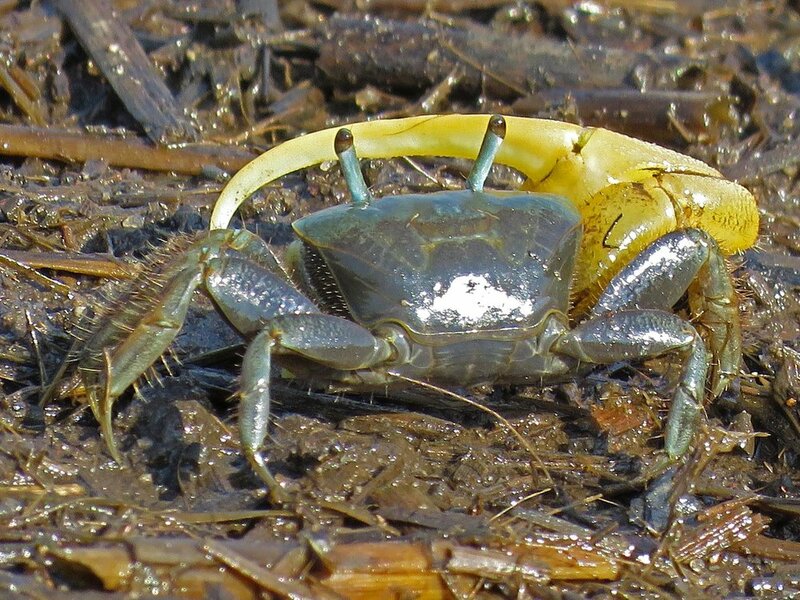 You can watch these little crabs eating, having small clashes and scurrying in groups across the mud. The music is a violin sonata by Jan Brandts Buys, performed by Steve's Bedroom Band and obtained from MusOpen.org, a royalty-free music source. The first fiddler crabs I saw were at Marine Park in Brooklyn on July 25, 2015. I watched as a young yellow-crowned night heron was dining on them as if they were popcorn. At first I thought they were bugs, but soon saw they were little crabs. These shots were taken Aug. 22, 2017, at Marine Park in Brooklyn. These shots were taken Sept. 20, 2017, at Hunter Island, near Orchard Beach, at Pelham Bay Park in the Bronx.